After Kristallnacht, America chose not to save Jewish children from the Nazis. 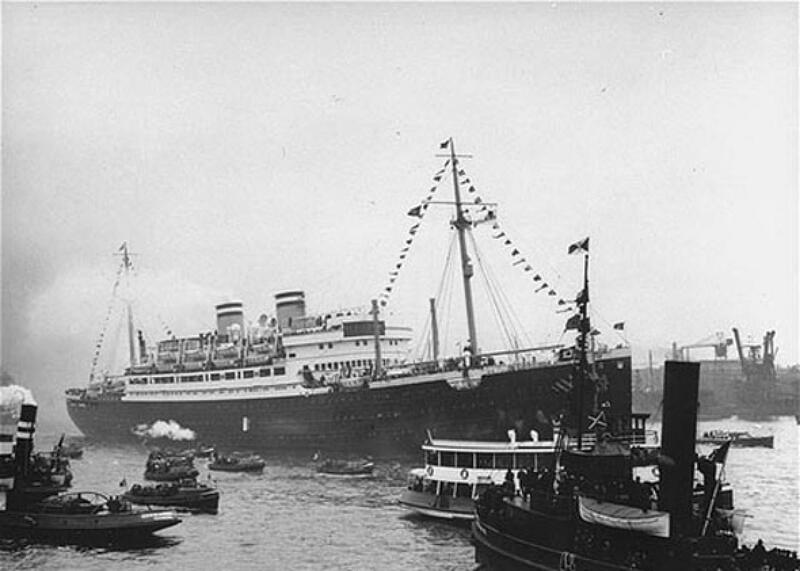 The St. Louis, carrying more than 900 Jewish refugees, waits in the port of Hamburg, Germany, 1939. The proposal was born in the aftermath of Kristnallnacht, the Nazi-directed pogroms of November 1938, when thousands of shops, homes, synagogues, and hospitals were destroyed and thousands of Jews arrested and sent to prison camps. The news shocked the world. But in the United States, with the country struggling to climb out of the Depression and unemployment still a potent issue, there was little political impetus to relax the restrictive quotas. The British were quicker to respond. A week after the violence in Germany, a group of prominent British Jews, including Chaim Weizmann, later the first president of Israel, approached Prime Minister Neville Chamberlain and floated the idea of temporarily admitting child refugees into the U.K., with the Jewish community fronting the cost. Within days, the British Cabinet approved the plan. On Dec. 1, 1938, less than three weeks after Kristallnacht, the first train departed Berlin with 200 children aboard whose orphanage had been set afire during the pogroms. Ten days later, another train left Vienna. Two months later, a legislative plan was hatched: Sen. Robert Wagner, Democrat of New York, and Rep. Edith Nourse Rogers, Republican of Massachusetts, jointly introduced a bill to admit 20,000 unaccompanied child refugees, 14 or younger, into the United States. The bill stipulated that the costs of caring for the children would be borne by the private sector and, crucially, that the refugees admitted would not count against the quotas limiting U.S. immigration. A number of prominent Americans threw their weight behind the bill: bishops and actors, former President Herbert Hoover, and New York Mayor Fiorello La Guardia. Even the first lady let her support be known. “It seems to me the humanitarian thing to do,” Eleanor Roosevelt said at a press conference when asked about the bill. But the opposition struck back with calls to, yes, put America first. “Protect the youth of America from this foreign invasion,” thundered John Trevor, the head of the American Coalition of Patriotic Societies, a restrictionist organization with a reach of about 2.5 million members. Trevor had built a career for himself by railing against rising immigration and its pernicious effect on America’s national character. He helped shape the 1924 Immigration Act, which established the restrictive quota system that was explicitly designed to curtail Italians and Jews, excluded the Japanese altogether, and stood as U.S. policy for 40 years. In April 1939, while congressional hearings on the refugee bill were being held, Fortune conducted a poll: If you were a member of Congress, would you vote to increase the number of European refugees currently admitted? Eighty-three percent of respondents said no. A month later, the St. Louis idled up the Florida coast with 900 refugees, only to be turned away. The prospect of inviting 20,000 children into the U.S. “is being opposed with as fiercely narrow a sincerity as if they were an invading host,” reported the New York Herald Tribune. From the White House, there was only silence. Despite her initial approval, Eleanor Roosevelt never publicly announced her support, and neither did her husband. By summer, the bill had been so drastically amended that the child refugees would now be counted against the immigration quota from Germany, bumping adults off the list. Sen. Wagner called this revision “wholly unacceptable” and said he preferred “to have no bill at all.” He soon got his wish. During the months that the American bill was debated and denuded, the British Kindertransports continued. From December 1938 until September 1939, about 10,000 young refugees escaped Nazi Germany. The majority never saw their parents again. Many went on to become highly accomplished adults, including the film director Karel Reisz, the geneticist Renata Laxova, the writer Lore Segal, the Nobel Prize–winning chemist Walter Kohn, and the politician Lord Alfred Dubs. Who knows what 20,000 children eligible for entry under the 1939 refugee bill could have accomplished. Or, more pressingly, what would become of a similar number of young Syrian or Sudanese refugees, if we only let them in.